I always have candy at my desk. I buy the 5-pound bags of Jolly Ranchers and just have them on a dish sitting on my desk. I noticed that everytime I have to fill up the basket of candy there is invariably ONE flavor that sticks out, meaning that it's always the one no one wants. As you may remember, I was at a tradeshow a few weeks back. If you've ever been at (either as a vendor or a visitor) I'm sure you know that people have all sorts of stuff to give out, well we decided since we didn't have any cool gimmies, we'd have candy instead. The funny thing was that I had set up our booth, I took all of my stuff (candy included) and threw it on the table and then went off to find our booth. 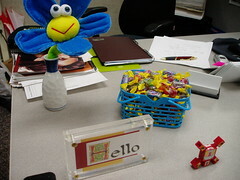 I was gone about 20 minutes and when I came back somone had already broken into the Jolly Ranchers! I knew this crowd was going to be hungry for them. It worked out quite well, everyone stopped buy to get a few Jolly Ranchers (they're perfect for meetings you know) and soon word got around that we had them. People would just walk by and say "oh you're the jolly rancher people." We had to constantly fill up the bowl because it would empty out fairly quickly. But, one evening I forgot to put the candy bowl away, and what do you think I discovered when I came back the next morning. The candy dish was about half full and there was on predominant flavor that was left in the bowl. But it was a different flavor than what was left over in the office. From the flavors listed above, which one is your favorite and which one do you go for if your favorite isn't available. What flavor do you think is always "left over" in my office? Euurrggh! All of those flavours sound revolting. You Americans are weird. But I'd bet it's the Cherry that gets left over. I eat all the apple sweet in a packet, and leave the grape behind. I'd say that the watermelon is left behind though cos that's blech! I came here via Ms Mac and I have to say that in my office experience, grape is always the one left over, and green apple always goes first, except when the bowl is on my desk and I take watermelon and Green apple second pick. I have never seen anyone actually eat a grape jolly rancher. Grape stays, apple gets eaten! Mind, I'm partial to watermelon too. Well, anything but grape. Watermelon is gross. I am equally willing to eat Green Apple, Grape, and Cherry. I'm with homuncula . . . watermelon first, cherry second, and grape gets left behind. I saw this on Ms.Macs site. I go for Green Apple, then Watermelon and next Grape. I think that the Rasperry would be left. I would go for Blue rasberry followed by cherry. I think grape would be the last to go. But anytime I've bought a packet just to eat the apple ones, I've found the cherry ones are always left and NOBODY will touch them. Not even if I give them away for free! Hi there! I would eat the blue raspberry followed closely by the watermelon. I would leave the cherry. By the way I came by thru Ms. Mac! I'd nosh all the apple fo rsure. The grape ones have my vote for the stragglers. I'd probably say the one left over was the Watermelon! My Fav is Green Apple!! I avoid the GRAPE... ugh. My favorite (after Fire, which is not listed) is Green Apple. I'd have to say that I would leave grape behind. It just tastes wrong. My Favorite is CHERRY! and then watermelon or Grape. I don't like Apple as much. But, honestly,I don't eat Jolly Ranchers oftenand can't remember what their grape is like. Sorry, I haven't had a jolly rancher of any flavor in so long that I can't remember what any of them taste like. I always found that their squarish shape hurt the inside of my mouth. Well, my fav has always been grape, green apple second. I would guess that watermelon gets left behind. I always get the watermelon or the grape... I can't tell the difference between any of the flavors except Green Apple and the rest of them, so I just go with the prettiest ones! I would say that grape gets left behind... or cherry. Cherry is so overdone, nobody ever wants it. What is everyone thinking?? Cherry MUST be first! I love it, love it, love it. Watermelon would be my second choice, in fact I would probably take 2 cherry, and 1 watermelon. now, how your basket couldn't overflow with left over green apple is soooo out of my realm of thinking... yuk, phooey, blah! I would take blue raspberry first... then green apple... I would never take watermelon or grape. I would say that grape is my favorite and would go for cherry second. I imagine green apple is the last to go. btw... found you via Gina. My favorite is grape... grape is the only ones ill eat.. if forced.. cherry is next.. but grape is the one and only for me! people in general though think that cherry is the fav. then watermelon, then apple, then blueraspberry, then grape..